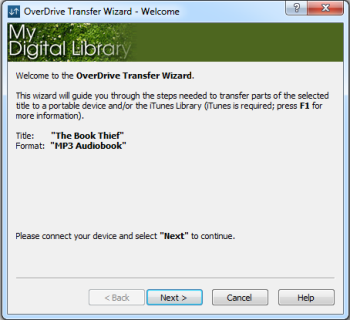 You can use OverDrive for Windows 8/10 to begin the transfer and burn processes for audiobooks. Note: If you have an iPod touch, you can borrow and download audiobooks directly using OverDrive for iOS or Libby. Connect your MP3 player or iPod to your Windows 8/10 device using a USB cable. For iPods only: Open iTunes and turn on the "Manually manage music" setting (or enable disk use for an iPod shuffle). 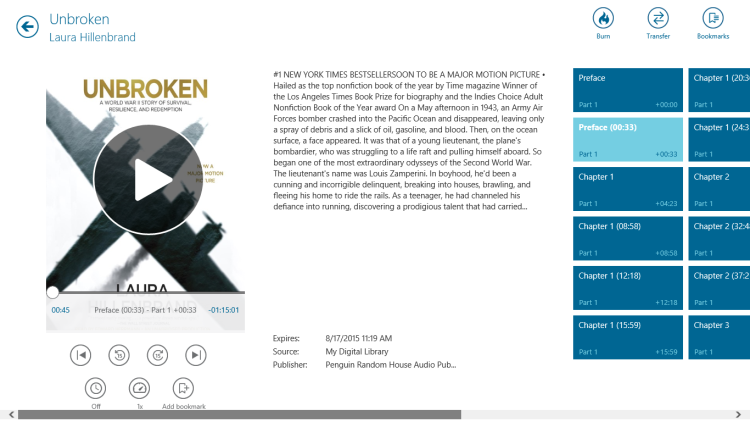 Open a downloaded audiobook in OverDrive for Windows 8/10. Select Transfer in the top-right corner. You'll be taken out of OverDrive for Windows 8/10. The transfer wizard in the desktop app will open. 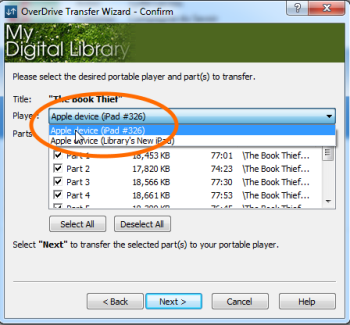 Follow the prompts in the wizard to transfer part or all of the audiobook to your device. Make sure to select your device from the "Player" list. If it doesn't appear, select Back and disconnect the device from your computer, then reconnect it and select Next. Once the audiobook transfers, select Finish. Select Burn in the top-right corner. You'll be taken out of OverDrive for Windows 8/10. The burn wizard in the desktop app will open. 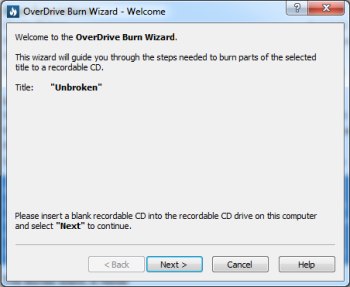 Follow the prompts in the wizard to burn part or all of the audiobook to a CD. Once the audiobook burns to a CD, select Finish.